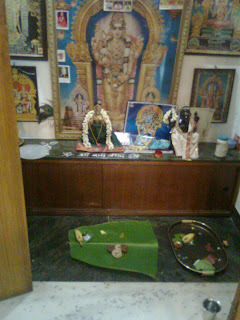 Today[14-03-2011] is Karadayan Nombu. This Nombu is observed for the long life of the husbands. The main ritual for this nonbu is tying of the Nonbu charadu [yellow thread, similar to the one the bridegroom ties around the neck of the bride at the time of marriage]. This year the time given for performing this Puja/ritual is between 8.00 and 9.00pm IST. 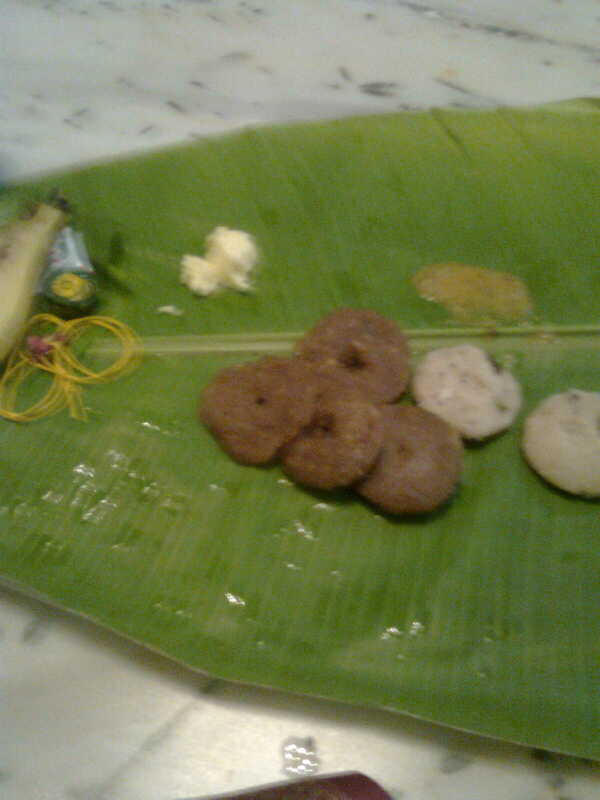 As is customary, both Vella Adai and Uppu Adai are prepared for Neyvedyam. I always prepare it with Karamani and this gives it a special taste and everyone in my family likes it very much when prepared like this. It is said that observing a fast on this important day for all the ladies, is very fruitful and brings lots of happiness and well-being in their family. 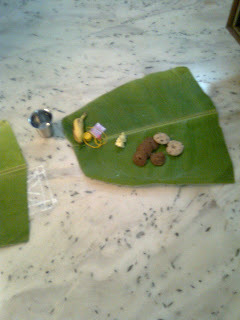 After preparing the Adais, we get ready for the puja. There is always a place for each female member of the family, however small the girl is. Even if there is only one female member, usually we never have one neyvedyam kolam or leaf. It is usually two. It is also customary to tie Nonbu Charadu for the Gangai Sombu if you have one at home in the Puja room, as the Gangai Sombu is considered to be very sacred to us Hindus. A banana leaf is put on each kolam. On the leaf, we place - one [sweet] Vella Adai and one Uppu Adai and some butter, two bananas, betel leaves and nuts, two pieces of turmeric, flowers and the Nonbu Charadu. which goes to mean .... “I offer butter and one adai, let me and my husband be together always." 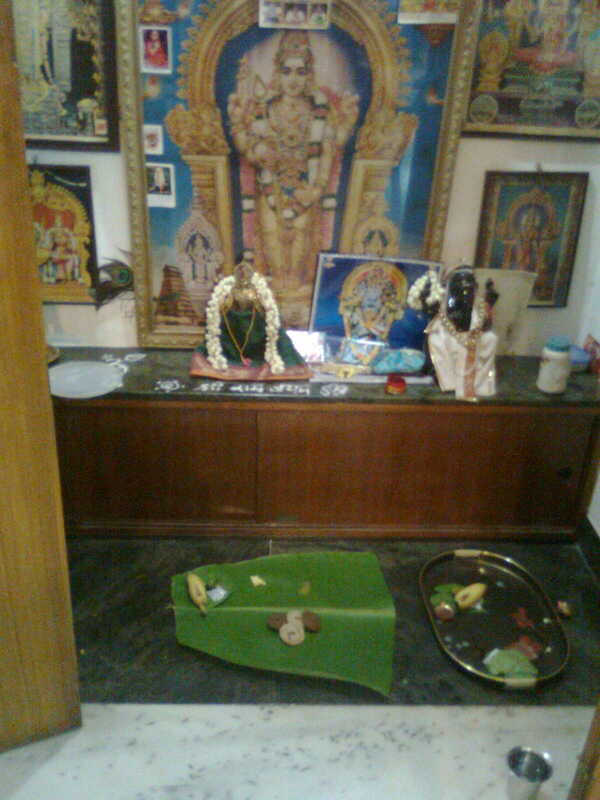 Hope all the ladies in their respective houses celebrate this Puja with utmost sanctity and Bhakthi today. *Plantain leaves to steam the adais. 1. Roast the rice flour in a shallow pan to a golden colour. 2. Cook the Karamani in a pan with enough water until half done. Melt the jaggery in 2 cups of water. When the jaggery is melted add the half cooked karamani, coconut gratings, cardamom powder and roasted rice flour and cook until all the water is absorbed. Allow to cool. 3. 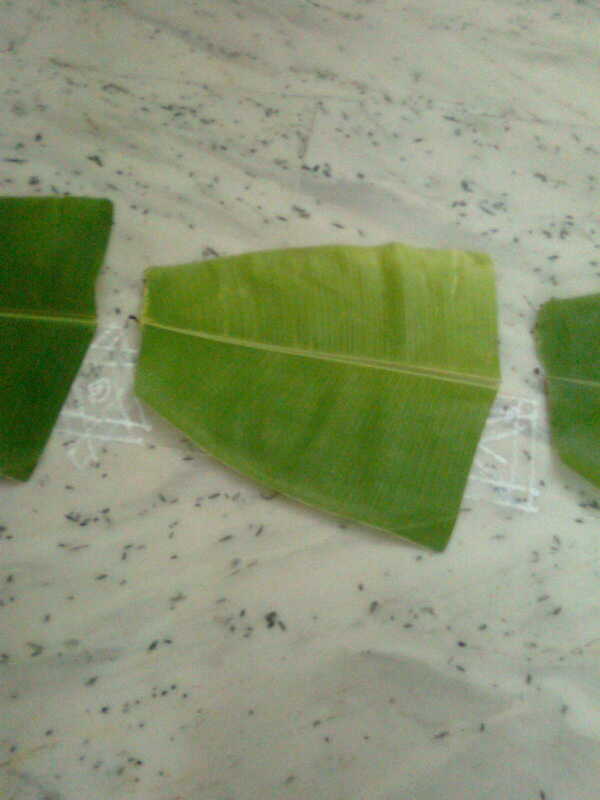 Make small pieces of plantain leaves. Make small balls of the cooked rice flour [the size of a small orange] and keep on the plantain leaf. Take some ghee and flatten with the palm[ghee for better taste] and make a small hole in the centre. Keep the plantain leaves on a steamer and steam for 10 mnts. 4. This is to be taken with some butter. *Plantain leaves to steam the adai. 1. Roast the rice flour to a golden brown colour. 2. Cook the Karamani in a pan with enough water until half done. 3. Heat the oil in a pan and add the hing. Add the mustard. When mustard starts spluttering, add the urad dal, green chillies and curry leaves. 4. Add 2 cups of water, salt to taste and the coconut gratings. When the water starts boiling add the half Karamani and rice flour and cook until all the water is absorbed. Allow it to cool. 5. Make balls of the cooked rice flour and flatten on plantain leaves and steam for 10 minutes as you do for Vella Adai. 6. This is to be taken with some Butter. PS: you can also cut the coconut into very small pieces[cubes] instead of grating it, for both Vella Adai and Uppu Adai. Happy Nonbu to each and everyone of the ladies out there! !